Ticket History is used for the end users to track the progress of all their submitted tickets. All the user’s recent tickets are displayed in "My Tickets" section, along with the status, last replier, priority and last updated date. Users can click on ’My Tickets’ link from header section of the front-end to manage their tickets (refer the screenshot given below). It will redirect you to My Tickets page from where you can view/manage all the Opened and Closed tickets (see the figure shown below). ID: This column displays the unique serial id of the tickets submitted by a user. Subject: This column displays subject i.e the question of the ticket which is submitted by the user. Last Updated: This column displays the date and time when the ticket was last updated. Last Replier: This column displays the name of the user who replied last to this ticket. Status: It displays the status of the ticket as open or closed. Users can click on View Opened/View Closed link to view the opened/closed tickets submitted by them. Priority: This column displays the priority of the ticket which was set by the user while submitting the ticket. Clicking on a particular subject or ID of a ticket will open up a preview of the user’s conversation with the support staff (as shown in the screenshot given below). The subject of the ticket is displayed at the top along with its current status, priority, date and time on which it was created, username and email address of the user who created it. The Conversation of the user with admin user is displayed in Conversation section of this page. 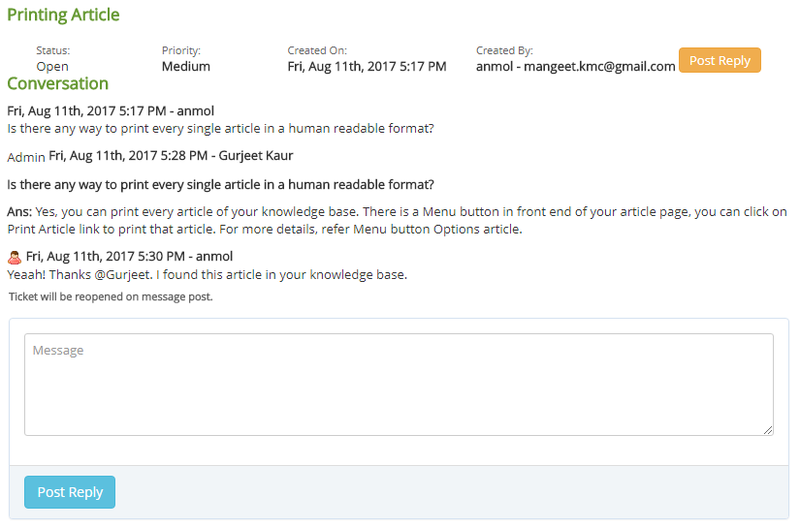 Refer the screenshot displayed above, where ’Anmol’ is the username of the requester and ’Gurjeet Kaur’ is the admin user. If you click on any closed ticket to reply back to the admin user, then "Ticket will be reopened on message post" will be displayed in the Conversation section. A user can easily view and track the history of any ticket with this way.